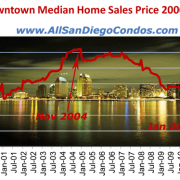 On the above chart which is based on monthly sales data from Sandicor and SDAR, we see that median sale prices in downtown San Diego reached their highs in November 2004 (at $620,000), showing a 56.45% increase of those in January of 2000. 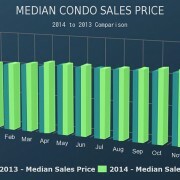 Since then, median sale prices were at their lowest in April of 2009 at only 25.41% above those in January of 2000, a 31.04% drop from the November 2004 highs. 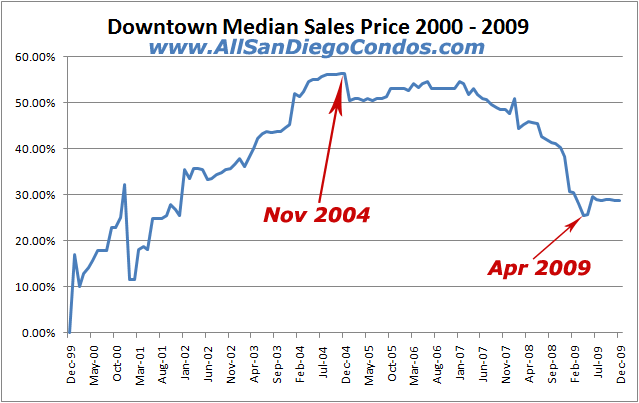 This chart also shows that since median sale prices for condominiums in downtown were at their lowest in April of 2009 (when compared to the November 2004 highs), at the end of the year, in December of 2009, median prices rose back up to $378,900 or a 28.74% increase of those in January 2009. Mac, this is just a very easy to understand chart where no explanation to the percentages is actually needed. 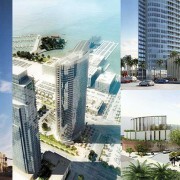 Thank you though for bringing it up. I edited the short explanation, so hopefully now it is much easier to understand and tie it to the chart.